Hurricane Maria’s devastation of Puerto Rico and other coastal communities in 2017 was a sobering reminder that climate change is happening now, and that the impacts hit hardest in low-income communities, communities of color, and communities historically overburdened by an extractive economy built on fossil fuels. For Latinx communities across the United States, the threats of climate change compound existing inequalities, including poverty, discrimination, proximity to environmental hazards, and challenges in immigration status during this malicious current federal administration. According to the Intergovernmental Panel on Climate Change’s 2018 report, the world has less than 12 years to rapidly and dramatically make changes to all aspects of society to limit global warming to 1.5°C. At the same time, the policy choices and investment decisions that determine how we reduce emissions can positively impact communities in important ways, including job creation, health improvements, and building wealth and resiliency. Right now, New York State has the opportunity to protect its most vulnerable populations from fossil fuel pollution and climate change impacts, and to ensure that environmentally vulnerable low-income communities are not left behind in the renewable energy economy. The Climate and Community Protection Act (CCPA), a major policy solution developed by the NY Renews coalition that is currently awaiting action by the New York State legislature, is the key to achieving these interrelated goals. Most importantly, New York’s Latinx communities, including black and indigenous peoples, as well as other communities of color, are a major focal point in this bold climate solution for all New Yorkers. This report outlines some of the particular risks and challenges facing Latinx communities, the efforts of grassroots community-based organizations to increase climate resiliency for Latinx communities, and how the CCPA can help drive resources to support these efforts and address racial inequity and climate change at the same time. Sets aside 40 percent of the state’s clean energy funding to be reinvested in frontline, environmental justice, and disadvantaged communities. Mandates that state agencies use an “equity screen”—a set of principles and policies that considers equity outcomes alongside climate outcomes, including mapping of targeted communities, tracking progress, and requiring agencies to develop regulations in line with meaningful public input. Creates a Climate Justice Working Group to identify disadvantaged communities across New York State, and to oversee policy design and implementation of equitable climate solutions. Together, these elements will benefit Latinx communities and other communities of color, low-income communities, and immigrants, while enabling them to play a significant role in shaping climate solutions for New York State. The NY Renews Coalition—with more than 160 members comprised of environmental justice groups, traditional greens, racial and economic justice groups, faith-based groups, and labor unions—was inspired by and created after the first People’s Climate March in 2014, with intersectional roots that started to deepen in the wake of Superstorm Sandy. The coalition follows a bottom-up decision-making process informed by the Jemez Principles of Democratic Organizing, giving grassroots leaders not just a voice but decision-making power in the development of policies, advocacy, and political strategy. Latinx and racial justice advocacy organizations are a cornerstone of NY Renews and include The New York City Environmental Justice Alliance (NYC-EJA), El Puente, Brooklyn Movement Center, Good Ole Lower East Side (GOLES), Make the Road NY, THE POINT CDC, PUSH Buffalo, and UPROSE. The strong climate justice commitments of the CCPA, in terms of both racial equity and labor standards, are clear and should serve as a model for embedding similar commitments in federal climate policy. No less important, however, is the process of policy development that led to the CCPA. Previous development of environmental and climate policies at the federal level has rarely been genuinely participatory, if at all. As the climate crisis accelerates and the communities most impacted by climate change continue to lead in developing solutions, the CCPA offers a model of that embraces robust participation of frontline leaders in determining policy and in developing the kind of grassroots engagement strategy that, more than ever, is needed to win on climate. The people of New York State already have the power to defeat injustice by winning on climate, and that power is in our people and our most impacted communities; the CCPA is proof of this and a solution for Latinx New Yorkers that speaks to the scale of the climate crisis while ensuring a Just Transition for impacted communities and workers alike. Climate change is increasing the frequency, duration, and severity of severe weather events; the Atlantic hurricane seasons over the past 6 years have thrown into stark relief the unequal impacts of severe weather on people of color and Latinx communities. Superstorm Sandy also revealed that recent immigrants are particularly vulnerable to the economic devastation in the aftermath of such events. Despite having about the same rate of labor force participation as US-born New Yorkers, the median earnings for immigrants are significantly lower (see Figure 1). Immigrants are also more likely to work in jobs without any paid leave, and to live in overcrowded housing with poor health and safety conditions; climate-related disasters like Superstorm Sandy only compound the many difficulties new immigrants already face. The greatest hurdle is faced by those immigrants who are "non-qualified aliens" under federal law and thereby barred from receiving cash assistance from FEMA or unemployment benefits.9 Missed paychecks as a result of weather-related emergencies greatly impact the ability of many immigrant families to meet basic needs. More broadly, many Latinx community members have challenges related to immigration status. Because of discrimination or justifiable fear, undocumented members of Latinx communities may be less likely to access financial assistance and other services related to disaster recovery and public health, which only compounds the socioeconomic vulnerabilities of Latinx communities facing acute climate change impacts. Latinx immigrants are among the most vulnerable in the United State to heat-related mortality. One study found that 87 percent of all U.S. heat-related deaths occurred among Hispanics.17 The same study found that undocumented Hispanics are 3.6 times more likely to die from heat-related causes than U.S.-born residents. Nationally, Latinx residents are over 20 percent more likely to live in the hottest parts of cities with less green space and more heat-retaining surfaces;18 and about one-third of Latinx households live without air-conditioning.19 Latinx residents are also heavily concentrated in southern and western states like Texas and California, which can expect to see more extreme temperature increases as climate change accelerates. Hunts Point in the South Bronx is one of the most heat-vulnerable communities in New York City. On top of this severe climate risk, residents are also victims of numerous spatial inequalities such as massive highways that bypass and border their communities, lack of waterfront access and green spaces, zoning policies that favor heavy industrial activity, and the disproportionate amounts of waste handling in this part of the city. Local community organizations are a critical resource for increasing the resiliency of Latinx communities. For example, The POINT CDC runs a program in partnership with NYC Emergency Management called Be A Buddy, which aims to build social cohesion and climate health awareness and education for those most vulnerable in the Hunts Point-Longwood community. THE POINT also manages Hunts Point Community Solar, a program that addresses the community’s long-standing energy burden, and Free Hunts Point Community WiFi, a network that can provide resilient communications during and after a climate-related severe weather event or other emergencies. – Fernando Ortiz, Climate Preparedness and Resiliency Organizer for THE POINT CDC, excerpt from testimony at the NYS Senate Climate Change Hearings, February 2019. Climate resiliency is the ability of communities to prepare for and recover from climate disasters. Low-income communities of color who face the constant, slow-moving disasters of systemic racism and inequality may not have the resources or capacity to effectively prepare for a severe storm. Studies have found that Latinx and African-American communities are at higher risk during disasters due to lower levels of disaster preparedness.24 One study found that foreign-born Latinx residents in Miami and Houston were less prepared for flooding, and either unaware of or ineligible for public assistance post-disaster.25 Language barriers can prevent residents with limited English proficiency from being fully prepared for an extreme weather event, and from taking advantage of resources to recover from disasters. In New York City, a community-led survey reported that 28 percent of Spanish speakers surveyed did not have access to information in their primary language prior to Superstorm Sandy.26 As noted earlier, Latinx families with mixed documentation status may also be less likely to trust public officials and agencies for fear of deportation. From extreme heat to more frequent and intense storms, the Lower East Side (LES) is already suffering from the effects of climate change, the risks of which are more severe due to a mix of environmental and social conditions—including a high concentration of public housing residents, aging infrastructure, loss of utility services due to landlord negligence, and a large concentration of community members who would need extra support in the event of a disaster. The impacts of Superstorm Sandy showed the critical role that community-based organizations (CBOs) played in disaster relief efforts. For example, immediately after the storm hit, Good Ole Lower East Side (GOLES) staff coordinated nearly 3,000 volunteers to canvass the area, assessing needs and providing residents with disaster assistance information, bringing relief and assistance to more than 15,000 households. In the months after the storm, GOLES convened other local CBOs to create a long-term recovery group called LES Ready, which has continued to work on increasing the resiliency and preparedness of the Lower East Side community. GOLES continues to lead efforts for community resiliency in LES by offering trainings and technical assistance to support community members in the creation of disaster and resiliency plans for their homes, buildings, and neighborhood. GOLES also provides seasonal trainings (e.g. hurricane, winter, extreme heat) and trainings for audiences with specific needs (e.g. elders, pet-owners, etc). On a building-wide level, GOLES works with residents to improve resilience in the following categories: energy, communications, food and water, health and wellness, and mobility. For Latinx communities in New York State, community resiliency is under siege from the impacts of climate change. Community vulnerability due to poor health and other climate change impacts only compounds the resiliency challenges associated with the socioeconomic inequities that have always been present in Latinx communities. Extreme racial wealth-gaps, for example, mean that most Latinx families do not have sufficient resources to purchase a home, pay for college, or offset major health events—all of which are necessary for upward mobility into the middle class. In heavily Latinx Sunset Park, Brooklyn, home to the Latinx environmental justice organization UPROSE, the poverty rate is 25 percent, nearly double the national rate, and residents face an acute affordable housing crisis, with a majority of households being rent-burdened (paying rent equal to 30 percent or more of household income). Climate pollution threatens all New Yorkers, but Latinx communities are disproportionately exposed and experience greater health risks from exposure to pollution. Co-pollutant emissions from burning fossil fuels—including carbon monoxide, sulfur dioxide, nitrogen oxides, particulate matter, and air toxics such as benzene—are a major factor in the state’s poor standing on environmental health. According to the American Lung Association, as of 2018, 8 New York counties are rated “F” for ground-level ozone, which is formed by chemical reactions between fossil fuel co-pollutants and sunlight. Seven of these eight counties—Bronx County, Queens County, New York County, Suffolk County, Westchester County, Richmond County, and Erie County–are home to more than 2.5 million Latinx residents. The total is more than 3 million if Kings County (Brooklyn) and Nassau County are included (these counties are not rated by the ALA due to insufficient monitoring).41 Ground-level ozone triggers asthma attacks and worsens other pulmonary problems, and it is causally associated with lung diseases such as chronic obstructive pulmonary disease. On average, residents of New York State’s 4 most Latinx-populated counties (Bronx, Kings, Queens, and New York) bear added cancer health risks from HAPs at a rate that is approximately 55 percent higher compared to the rest of New York State (see Figure 3) and these counties rank 1-4 in New York State for both cancer risks and non-cancer health risks due to HAPS (see Table 1 further below). Exposure to criteria air pollutants from air-polluting facilities is nearly 200 percent greater in New York’s four most Latinx-populated counties compared to the state as a whole (see Figure 4). Across New York State, as noted earlier, people of color face significantly more exposure to air-polluting facilities compared to white people (see Figure 5), and likewise significantly more added cancer risk from HAPs compared to white people (see Figure 6). Nationally, New York’s four most Latinx-populated counties are among the top ten counties for cancer risk from HAPs; further, New York’s four most Latinx-populated counties comprise the top four counties nationally for non-cancer health risks from HAPs (see Table 1). In New York’s nine most Latinx counties (Bronx, New York, Queens, Kings, Suffolk, Nassau, Westchester, Richmond, and Erie), the number of air-polluting facilities per square mile is approximately 50 times greater, on average, in these counties compared to the rest of the state. 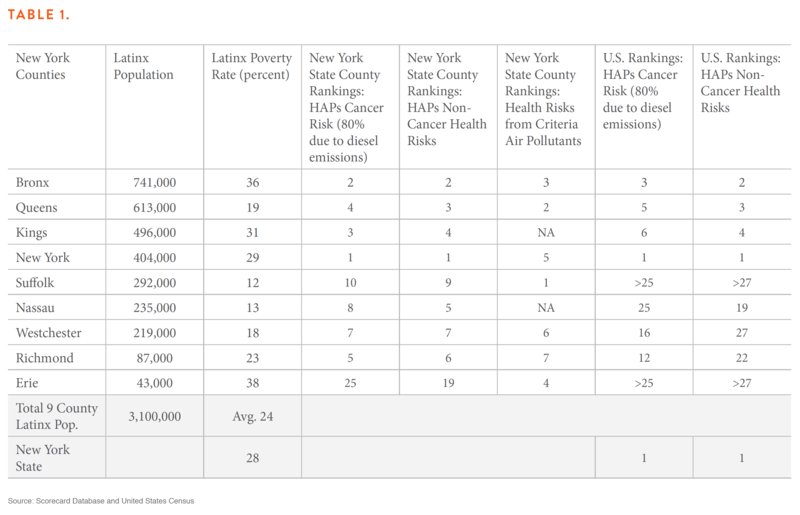 Seven of the nine most Latinx-populated counties in New York also comprise the state’s top seven counties for criteria air pollutant emissions, a major source of respiratory and other health problems (see Table 1). New York County is ranked sixth nationally for annual PM 2.5 (particulate matter) emissions. Within majority-Latinx Bronx county, added cancer risk from air pollution is 9 percent higher for people of color compared to white people who live in the county. According to the Environmental Protection Agency’s Toxics Release Inventory (TRI), people of color who live in Bronx County are exposed to toxic chemical releases at nearly twice the rate of white people, and people of color are exposed to 57 percent more air-polluting facilities per square mile compared to white people in the Bronx. In Kings County (Brooklyn), home to more than 500,000 Latinx people, people of color are burdened with cancer risk from air pollution at a rate approximately 11 percent higher compared to white people, while the concentration of air-polluting facilities is 38 percent greater for people of color compared to white people in the county. In New York County (Manhattan), home to more than 400,000 Latinx people, people of color are exposed to toxic releases at nearly twice the rate of white people. Both Nassau and Suffolk Counties on Long Island, together home to more than 500,000 Latinx people, rank among the top 10 counties in New York State for added cancer risk from HAPs. People of color in Suffolk and Nassau Counties are exposed to 1.4 times the number of air-polluting facilities compared to white people in these counties (see Figure 7). In Westchester County, where people of color comprise 27 percent of the population, added cancer risk from HAPs is approximately 18 percent greater for people of color as compared to white people, and people of color are exposed to air-polluting facilities at 4 times the rate of white people (See Figure 8). Latinx populations bear similarly disproportionate pollution burdens in upstate New York. In Erie County, which includes the city of Buffalo and is home to nearly 50,000 Latinx people as of 2017, cancer risk from HAPs is 38 percent higher for people of color compared to white people, and exposure to air-polluting facilities is approximately 2.8 times greater for people of color. In Monroe County, which includes the city of Rochester and is home to more than 26,000 Latinx people, cancer risk from HAPs is more than 41 percent higher for people of color compared to white people, and people of color are exposed to polluting facilities at more than 5 times the rate of white people. In Onondaga County, which includes the city of Syracuse and is home to more than 22,000 Latinx people, people of color face greater cancer risk from air pollution, by 29 percent, and they are 1.5 times more exposed to polluting facilities compared to white people in the county. New York’s transportation sector is its biggest source of air pollution, and our transportation densities combined with discriminatory siting of transportation hubs and corridors places an undue burden of traffic on communities of color. With more than 11 million vehicles on its roads, including about 2.5 million mainly diesel-powered trucks and over 70,000 mainly diesel-powered buses, New York imports the equivalent more than 190 million barrels of oil per year, nearly 80 percent of which is used for transportation. A single diesel school bus annually produces approximately 1,300 pounds of criteria air pollutants, as well as 23 tons of greenhouse gases (GHGs)—while less than 1 percent of vehicles statewide are electric or utilize alternative fuels.51 As we can see in Figure 9, New York City neighborhoods with significant Latinx populations are highly burdened by traffic proximity, with traffic exposure greater than that found in at least 70 percent of census tracts across the country as a whole. In New York City, transportation emissions of particulate matter alone contribute to nearly 400 deaths and more than 800 hospital visits annually, accounting for more than 5800 years of lost life.52 As we can see in Figure 10, particulate matter emissions from transportation are concentrated in the Bronx, a majority-Latinx county. Northern Manhattan, also majority-Latinx in population, and, to a lesser extent, Central Brooklyn and North Brooklyn, also suffer from high levels of particulate matter from trucks, buses, and cars. A major source of Particulate Matter 2.5 and high asthma prevalence in North Brooklyn is the Brooklyn Queens Expressway (BCE). El Puente, a leading Latinx social justice and cultural organization based in South Williamsburg and a member of New York Renews, has long led advocacy efforts to address the disproportionate pollution impacts of the BQE in this part of the city. Part of this effort has included citizen science projects involving air quality monitoring to better understand the risks in the community. Data from air quality monitoring is used to advocate for increased and improved open spaces and green infrastructure to mitigate poor air quality. One such project is the BQ Green, a proposal to deck over part of the BQE by connecting two existing parks adjacent to the BQE in Williamsburg. El Puente works with a coalition of organizations in North Brooklyn to raise awareness and build support for this project. As these studies suggest, health improvements can generate appreciable health care savings for New Yorkers. The energy efficiency study cited above estimates annual monetized benefits between $275 million and $1 billion in New York State. Recent market shifts in the electricity sector coupled with state investments in energy efficiency have generated modest reductions in fossil fuel pollution, with estimated health care savings for New Yorkers in a range between $800 million and $1.8 billion over the 5-year period of 2009-2014, mainly from reductions in pollution-related mortality.56 An emissions reduction policy that, like the CCPA, includes fossil fuel co-pollutants, is economy-wide (including transportation, buildings, and industry as well as electricity), and demands high levels of investment to achieve aggressive, and mandatory, emissions goals, will increase the health-related economic benefits of emissions reductions exponentially. Energy cost savings can also be a significant benefit of climate policy in New York. New York State investments in energy efficiency and renewable energy from 2010-2018 will generate an estimated $5.2 billion in lifetime savings for participating households.57 As with health savings, the CCPA promises substantially greater energy savings for New York State households, proportionate to the much higher levels of overall investment needed for the policy’s emissions goals. Last but not least, job creation is another major benefit of investing in a renewable energy transformation for New York. CCPA-specific employment estimates have been calculated and we turn to that analysis in the following section. Latinx communities, other communities of color, and low-income communities that are disproportionately exposed to fossil fuel pollution could benefit the most from improvements in health and resiliency associated with emissions reductions and transitioning to renewable energy. However, this will only be the case if 1) emissions reduction targets also include harmful co-pollutants and cover transportation, buildings, and industry, and 2) these policies are well-targeted for the most impacted communities, both in terms of emissions reduction goals as well as programmatic investments in emissions-reducing projects and initiatives. Fortunately, we have a policy in New York State that is expansive and well-targeted in just these ways, promising significant benefits for Latinx communities across the state. The Climate and Community Protection Act, which is currently before the New York State legislature, offers a solution for climate impacts, and climate inequities, that New York State needs—especially for its hardest hit communities. The CCPA puts New York State on a path to zero-greenhouse gas emissions economy-wide by 2050, with interim benchmarks of a 50 percent reduction by 2030 and an 80 percent reduction by 2040. It also has a benchmark of 50 percent renewables in the electricity sector by 2030. The CCPA codifies these targets into law, thereby inoculating the zero emissions goal from being subject to the discretion of the governor and state agencies. Community solar projects (see the UPROSE text box) often face financing barriers for start-up capital. CCPA-targeted funding can be used to replace private financing with outright grants, thereby securing the full benefit of the solar energy generated for residents of the community. Electrifying public or publicly-contracted fleets, particularly buses and garbage trucks–is a significant opportunity for Latinx and other communities of color, especially for improving health in densely trafficked neighborhoods. Well-targeted and community-consulted climate change adaptation investments under the CCPA could help protect Latinx New Yorkers from the dangers of climate change as experienced in low-income communities with fewer resources to ensure resiliency. Expanding community green spaces will bring multiple benefits, especially on emissions and both physical and mental health. The CCPA will also bring also economic benefits in the form of job creation and high-road labor standards, among other benefits. The CCPA’s hallmark is targeted investment for high-need communities. These communities have carried the burden of our pollution, but the CCPA puts them, instead, at the center of the renewable energy transition. Under the CCPA’s 40 percent investment mandate for environmentally vulnerable low-income communities, if even one-third of the overall investments needed to reach the 2050 target is publicly funded, approximately 21,000 jobs will be created in the most impacted communities, generating more than $14 billion in income over a decade for new clean energy workers in fossil fuel-impacted places like New York City, Long Island, and Buffalo. If a larger share of CCPA investment is public, or if the state adopts emissions pricing to finance its renewable energy transition, potentially many more thousands of jobs will be supported by renewable energy investments in New York State’s most vulnerable communities. Government-funded investments under the CCPA come attached with high-road workforce and contracting standards, to ensure that the workers who carry out New York State’s renewable energy transformation can thrive, in their work and daily lives. In addition, communities can help prepare their members for this new clean energy employment by using CCPA-targeted funds for training and apprenticeship programs, which are required by the policy. Frontline communities that would benefit from the CCPA are not waiting to enact bold solutions to the climate crisis that are rooted in local leadership. For example, UPROSE, Brooklyn’s oldest Latinx community-based organization, has spent the last several decades organizing and leading around environmental justice and social justice issues, and, since 2006, has sharpened its focus on climate justice, social cohesion and the adaptation of its home community, Sunset Park, to the impacts of climate change. This includes a focus on community resilience and building and advocating for a Just Transition. “As one of New York City’s last manufacturing districts, Sunset Park is primed to become a climate resilience and green jobs hub to meet the city and state’s climate goals. The working waterfront has 20 million square feet of industrial space and holds 21,000 jobs along with nearly 40 percent of those in the industrial sector. As we speak, around 6 million square feet of industrial space in the waterfront is undergoing a rezoning process to allow for commercial, luxury hotel and recreational space. For years UPROSE has been advocating in favor of a working waterfront that meets New York State’s and the region’s needs for a transition to a renewable energy economy. “Currently, among other climate adaptation initiatives UPROSE is developing New York State’s first community-owned solar cooperative on the roof of the Brooklyn Army Terminal (BAT). The Sunset Park Solar project, with an 80,000 square foot solar array, will serve about 200 residents and small businesses providing subscribers with up to 20% savings in their energy utility bills. It will also allow subscribers to own and manage the project. One of the challenges of the project has been securing funding. Since this is a community-led project, funding is limited and has pushed the project’s team to create creative partnerships to build capacity and tap into the often-limiting sources of tax equity and philanthropy. A Climate Justice Working Group will be established and charged with formulating a climate justice screen to identify “disadvantaged communities” based on a variety of criteria including income, unemployment, public health, energy burden, history of discrimination on the basis of race or ethnicity, cumulative environmental pollution, and vulnerability to climate change impacts. The working group’s membership rules give strong representation to environmental justice leaders, and the working group must be consulted on the planning process for implementation of the CCPA, which will be led by the Department of Environmental Conservation (DEC). This consultation is inclusive of proposed regulations to achieve GHG emissions limits; investments of funds to benefit disadvantaged communities; and preparation of reports on implementation of the CCPA as well as a separate report on low-income accessibility of, or community ownership of, distributed energy generation and other programmatic aspects of the renewable energy transformation. The CCPA’s required scoping plan includes co-pollutants and co-benefits. In developing a scoping plan to achieve GHG emission limits, the DEC must quantify environmental, economic, and public health co-benefits, including the reduction of co-pollutants from fossil fuels and other sources. Based on this quantification, the plan must identify measures to maximize reductions of both GHG emissions and co-pollutants in disadvantaged communities. Implementation of the CCPA elevates equity criteria in all phases, including the issuing of regulations, agency actions, and reporting requirements to assess effectiveness on emissions as well as equitable implementation of GHG and co-pollutant emissions reductions in the most impacted communities. The DEC is required to prepare a report on access barriers in disadvantaged communities. This report will focus on access to, or community ownership of, distributed renewable energy generation, energy efficiency and weatherization investments, zero-emissions and low-emission transportation options, adaptation measures, and other services and infrastructure. New York State is one of America’s bluest states politically, yet its track record on climate policy and environmental justice falls well short of what is needed for a Just Transition away from fossil fuels. The CCPA is the opportunity New York State needs to leap to the forefront of climate action, creating jobs where they are needed most, improving public health in our most vulnerable communities, and helping to promote community-led solutions to the climate crisis. As this report makes clear, the costs of inaction, particularly for Latinx and other communities of color, vastly outweigh any costs associated with reducing our dependence on fossil fuels. The combination of job creation, health benefits, and energy savings from transitioning to 100 percent renewable energy is not only critical for economic development across the state, it is also the key to a Just Transition centered on the most impacted communities. As climate change, longstanding socioeconomic inequities, and anti-immigrant racism and backlash accelerate, New York has the opportunity to take a stand for social, racial, and climate justice by passing the most progressive climate policy in the nation. Now is the time for our elected leaders to act on behalf of all New Yorkers, but especially for the benefit Latinx New Yorkers and all New Yorkers of color. This report and underlying research were produced by core members of the NY Renews coalition, with Lew Daly of Demos and Priya Mulgaonkar of the New York City Environmental Justice Alliance (NYC-EJA) as lead researchers and authors. Many thanks to Leslie Velasquez from El Puente, Julian Morales and Elizabeth Ortiz from Good Ole Lower East Side (GOLES), Jose Lopez from Make the Road NY, Annel Hernandez and Eddie Bautista from NYC-EJA, Fernando Ortiz and Angela Tovar from THE POINT CDC, and Lourdes Pérez-Medina and Elizabeth Yeampierre from UPROSE. Founded in 1991, the New York City Environmental Justice Alliance (NYC-EJA) is a non-profit, 501(c)3 citywide membership network linking grassroots organizations from low-income neighborhoods and communities of color in their struggle for environmental justice. NYC-EJA empowers its member organizations to advocate for improved environmental conditions and against inequitable environmental burdens by the coordination of campaigns designed to inform City and State policies. Through our efforts, member organizations coalesce around specific common issues that threaten the ability for low-income communities of color to thrive. NYC-EJA is led by the community-based organizations that it serves, with its board elected by its member groups, who set policy and guide program development. 1. On the concept of a Just Transition, see the Movement Strategy Center, https://movementgeneration.org/movement-generation-just-transition-framework-resources/. 2. Edward D. Vargas, "Latina/o Voters Are Both Experiencing Climate Change and Wanting to See Congress Pass Environmental Policies That Reduce Pollution and That Invest in Clean Energy," Latino Decisions, 2018, http://www.latinodecisions.com/blog/2018/11/09/latina-o-voters-are-both-experiencing-climate-change-and-wanting-to-see-congress-pass-environmental-policies-that-reduces-pollution-and-that-invest-in-clean-energy/. 3. Climate Change in the Latino Mind, Yale Center on Climate Communication, May 2017, http://climatecommunication.yale.edu/wp-content/uploads/2017/09/Climate-Change-Latino-mind-May-2017.pdf. 4. Nuestro Futuro: Climate Change and U.S. Latinos, Natural Resources Defense Council, October 13, 2016, https://www.nrdc.org/resources/nuestro-futuro-climate-change-and-us-latinos. 5. Sandy’s Effects on Housing in New York City, New York University: Furman Center for Real Estate and Urban Policy, 2013. 6. Weathering the Storm, LES Ready!, https://static1.squarespace.com/static/5a83696fb0786935f4bd17f5/t/5bf42a28032be48ae7ae5ac4/1542728312521/Weathering+the+Storm+Report.pdf. 8. Unmet Needs: Superstorm Sandy and Immigrant Communities in the Metro New York Area, Make the Road New York, December 2012, https://maketheroadny.org/pix_reports/MRNY_Unmet_Needs_Superstorm_Sandy_and_Immigrant_Communities_121812_fin.pdf. 9. FEMA Fact Sheet, https://www.fema.gov/media-library-data/1528984381358-6f256cab09bfcbe6747510c215445560/IndividualsHouseholdsPrograms.pdf. 10. Eddie Bautista, et. al., "New York City Environmental Justice Alliance Waterfront Justice Project," Local Environment 20:6 (2014), 664-82. 11. NYC-EJA Waterfront Justice Project Map, NYC Environmental Justice Alliance, 2019, https://scaan.net/waterfrontmap/. 13. Climate Change Indicators in the United States: Heat-Related Deaths, Environmental Protection Agency, 2016, https://www.epa.gov/sites/production/files/2016-08/documents/print_heat-deaths-2016.pdf. 14. Climate Change 2014: Impacts, Adaptation, and Vulnerability, Intergovernmental Panel on Climate Change, 2014, www.ipcc.ch/report/ar5/wg2. 15. New York City Assesses Extreme Heat Climate Risk, Environmental Protection Agency Climate Change Adaptation Resource Center, https://www.epa.gov/arc-x/new-york-city-assesses-extreme-heat-climate-risk. 16. Heat-Related Deaths, Environmental Protection Agency, 2016, https://www.epa.gov/sites/production/files/2016-08/documents/print_heat-deaths-2016.pdf. 17. Carolyn Crist, "Immigrant Workers in U.S. Have Tripled Risk for Heat-related Death,” Reuters, November 30, 2017, https://www.reuters.com/article/us-temperature-immigrants-casualties/immigrant-workers-in-u-s-have-tripled-risk-for-heat-related-death-idUSKBN1DE2G3. 18. Nuestro Futuro: Climate Change and U.S. Latinos, op. cit. 20. Eddie Bautista, et. al. “NYC Climate Justice Agenda: Midway to 2013, Building Resiliency and Equity for a Just Transition.” NYC Environmental Justice Alliance, April 2018, http://www.nyc-eja.org/wp-content/uploads/2018/04/NYC-Climate-Justice-Agenda-Final-042018-1.pdf; Resident Data Book, New York City Housing Authority, 2015, https://www1.nyc.gov/assets/nycha/downloads/pdf/res_data.pdf. 21. New York City Population Fact Finder, Demographic Profile (2012-2016), https://popfactfinder.planning.nyc.gov/profile/18155/demographic. 22. Cool Neighborhoods NYC, The City of New York, https://www1.nyc.gov/assets/orr/pdf/Cool_Neighborhoods_NYC_Report_FINAL.pdf. 23. Community District Profiles, NYC Planning, https://communityprofiles.planning.nyc.gov/bronx/2. 24. D. P. Eisenman, et. al., “Improving Latino Disaster Preparedness Using Social Networks,” American Journal of Preventive Medicine, 37:6 (2017), 512–517. 25. Alejandra Maldonado, et. al., "Hispanic Immigrants’ Vulnerabilities to Flood and Hurricane Hazards in Two United States Metropolitan Areas," Geographical Review, 106:1 (2015), 109-35. 26. Getting LES Ready, GOLES, 2017, https://goles.org/wp-content/uploads/2017/11/cdp-web-doc_report_lesready_20141117.pdf. 28. Arelis R. Hernandez and Laurie McGinley, “A Harvard Study says 4,600 have Died from Hurricane Maria,” Washington Post, May 29, 2018, https://www.bostonglobe.com/news/nation/2018/05/29/harvard-study-estimates-thousands-died-puerto-rico-due-hurricane-maria/3Gdc34Fh5iSEPTmlXzCaVP/story.html. 29. Tatiana Davidson, et. al., "Disaster Impact Across Cultural Groups: Comparison of Whites, African Americans, and Latinos," American Journal of Community Psychology, 52:1-2 (2013), 97-105. 30. F. H. Norris, et. al., “60,000 Disaster Victims Speak: Part I. An Empirical Review of the Empirical Literature, 1981–2001, Psychiatry, 65:3 (2002), 240-260. 31. A. Fothergill, et. al., “Race, Ethnicity, and Disasters in the United States: A Review of the Literature,” Disasters, 22:3 (1999), 156–173. 32. Yessenia Funes, "Survey Reveals Hurricane Harvey Hit Blacks and Latinos Hardest," Earther, December 07, 2017, https://earther.gizmodo.com/survey-reveals-hurricane-harvey-hit-black-and-latinos-h-1821082159. 33. Junia Howell and James R. Elliott, “Damages Done: The Longitudinal Impacts of Natural Hazards on Wealth Inequality in the United States,” Social Problems, August 14, 2018, https://doi.org/10.1093/socpro/spy016. 35. “Health of Latinos in New York City,” NYC Department of Health and Mental Hygiene, 2017, https://www1.nyc.gov/assets/doh/downloads/pdf/episrv/2017-latino-health.pdf. 36. Alexia Elejalde-Ruiz, "Fear, Anxiety, Apprehension: Immigrants Fear Doctor Visits Could Leave Them Vulnerable to Deportation," Chicago Tribune, February 28, 2018. https://www.chicagotribune.com/business/ct-biz-immigration-fears-hurt-health-care-access-0225-story.html. 37. Scorecard: The Pollution Information Site, http://scorecard.goodguide.com/community/ej-summary.tcl?fips_state_code=36&backlink=tri-st#compare. http://scorecard.goodguide.com/env-releases/HAPs/rank-states.tcl?how_many=100&drop_down_name=Noncancer+cumulative+hazard+index&rank_source_type=all. Scorecard is the most widely used community pollution database, drawing mainly on EPA data. 38. 2016 TRI Fact Sheet—NY, 2018, https://iaspub.epa.gov/triexplorer/tri_factsheet.factsheet_forstate?pstate=NY&pYear=2016&pParent=NAT. 39. Jeffrey Schrader, et. al. Valuing Pollution Reductions, Institute for Policy Integrity (New York University), March 2018, https://policyintegrity.org/files/publications/Valuing_Pollution_Reductions.pdf. 40. “Environmental Value of Distributed Energy Resources in New York State,” Institute for Policy Integrity, 2018, https://policyintegrity.org/documents/NY_DPS_E_Value_Presentation_071118.pdf; Air Pollution and the Health of New Yorkers: The Impact of Fine Particles and Ozone, New York City Department of Health and Mental Hygiene, 2011, https://www1.nyc.gov/assets/doh/downloads/pdf/eode/eode-air-quality-impact.pdf. 41. State of the Air 2018, American Lung Association, https://www.lung.org/our-initiatives/healthy-air/sota/city-rankings/states/new-york/#hide-tabs-1. 42. “Asthma Prevalence in the United States and New York State by Race/Ethnicity,” https://www.health.ny.gov/statistics/ny_asthma/asthmaprevchild13.htm#race. 43. Clearing the Air: Assessing and Addressing the Impacts of Short-Changing New York’s Air Regulators, Environmental Advocates of NY, December 2015, http://www.eany.org/our-work/reports/clearing-air-december-2015. 44. “Distribution of Risks by Race/Ethnicity and Income in New York,” Scorecard database, http://scorecard.goodguide.com/community/ej-risk.tcl?fips_state_code=36&fips_county_code=36005. 45. “Distribution of Environmental Burdens in New York,” Scorecard database, http://scorecard.goodguide.com/community/ej-summary.tcl?fips_state_code=36#dist. 46. Bulleted data points that follow all derive from the Scorecard database, op. cit. 47. Clearing the Air: How Reforming the Commercial Waste Sector Can Address Air Quality Issues in Environmental Justice Communities, Transform Don’t Trash NYC Coalition, 2016, http://transformdonttrashnyc.org/wp-content/uploads/2016/09/Final-draft-v3_TDT-Air-Qual-Report_Clearing-the-Air-1.pdf. 48. Carlos A. Restrepo and Rae Zimmerman, eds., “South Bronx Environmental Health and Policy Study,” Final Report for Phase VI, April 2009, https://wagner.nyu.edu/files/publications/6%20NYUWagnerPhaseVIReport1April2009.pdf. 49. 2016 Health Care Disparities in New York State, https://www.health.ny.gov/health_care/managed_care/reports/docs/demographic_variation/demographic_variation_2016.pdf. 50. State of Our Immigrant City, Mayor’s Office of Immigrant Affairs, 2018, https://www1.nyc.gov/assets/immigrants/downloads/pdf/moia_annual_report_2018_final.pdf. 51. A Greener Transportation Future for the Empire State, Energy Vision, https://energy-vision.org/white-papers/A-Greener-Transportation-Future-for-the-Empire-State2.pdf. 52. Iyad Kheirbek, et. al., “The Contribution of Motor Vehicle Emissions to Ambient Fine Particulate Matter Public Health Impacts in New York City: a Health Burden Assessment,” Environmental Health, 15:1 (2016), https://www.ncbi.nlm.nih.gov/pmc/articles/PMC5002106/. 53. Benefits and Costs of the Clean Air Act 1999-2020, the Second Prospective Study, Environmental Protection Agency, 2011, https://www.epa.gov/clean-air-act-overview/benefits-and-costs-clean-air-act-1990-2020-second-prospective-study. 54. Dallas Buttraw, “Significant Widespread Health Benefits Possible Under EPA’s Clean Power Plan,” Resources for the Future, May 2014, available at http://www.rff.org/blog/2015/significant-widespread-health-benefits-possible-under-epa-s-clean-power-plan. 55. Jonathan I. Levy, et. al., “Carbon Reductions and Health Co-Benefits from U.S. Residential Energy Efficiency Measures,” Environmental Research Letters, March 2016, https://iopscience.iop.org/article/10.1088/1748-9326/11/3/034017/meta. 56. Analysis of the Public Health Impacts of the Regional Greenhouse Gas Initiative, 2009-2014, ABT Associates, January 2017, https://www.abtassociates.com/insights/publications/report/analysis-of-the-public-health-impacts-of-the-regional-greenhouse-gas-0. 57. New York State Regional Greenhouse Gas Initiative-Funded Programs Status Report, New York State Energy and Research Development Authority, December 2018, https://www.nyserda.ny.gov/About/Publications/Program-Planning-Status-and-Evaluation-Reports/RGGI-Reports. 58. Green Development Zone, PUSH Buffalo, https://ppgbuffalo.org/files/documents/push_buffalo_27s_green_development_zone.pdf. 59. Lew Daly, The Climate and Community Protection Act: A Big Win on Jobs and the Economy for New York State, Demos, April 2019, https://www.demos.org/publication/climate-and-community-protection-act-big-win-new-york-state-jobs-and-economy.